Update: I wrote this in 2006. If I wrote it today I would do it a little differently. Specifically, I would point out that contemporary science has shown us that the direct descendants of the ancient Israelites are the Palestinians, not the Ashkenazi or Berber Jews who have colonised Palestine in recent years. Shlomo Sand’s excellent book The Invention of the Jewish People, reviewed here, summarises the science and undercuts the blood-and-soil aspects of Zionism which are so important to Christian Zionists and their ultimately anti-Semitic agenda. When I first read your letter I thought, this is Christian fundamentalism. There’s nothing to be done when your opponent has a fixed idea of a religious text. What’s the point? Letting it brew in my mind for a few hours, however, I find I have arrived at what may be a glimmer of light, a point on which we may be in some kind of partial agreement. (I’ll get to that at the end.) And that’s the benefit of communicating by letter: it allows for emotional reactions to subside into something more constructive. I must say I take some exception to your comment about my limited Biblical knowledge. I have read the Bible and have read about the different interpretive traditions in Christianity. Of course I am aware of the scriptures which say God promised the land to the tribes (the Quran tells the same story), and I know about the prophets such as Isaiah and Ezekiel who foretold the doom and then re-establishment of Israel. However, to go from here to the political belief that we should support a 20th century ethnic cleansing and the establishment of a state in the 20th century definition of the term is an interpretation, and not ‘the Bible.’ I think it is important to recognise this, even if you believe the interpretation is the right one. It seems to me that the followers of all religions fall into trouble, even into immorality, when they can’t distinguish between the word of God and their own interpretations. I know that the pro-Zionist interpretation is prevalent in the United States, but I continue to assure you that it is not nearly so prevalent in Europe. Many European interpretations of Old Testament prophecy have been symbolic, understanding the reestablishment of Israel to mean the establishment of the Kingdom of God with the coming of Christ. Of course, the Palestinian and Syrian Christians I have spoken to about this are horrified and deeply confused by American Christian support for Zionism. Still more to the point if we are discussing Biblical texts, the preaching of Christ according to the New Testament does not seem in any way to support exclusive nationalism or violence. I can’t imagine the Christ of the Sermon on the Mount manning a checkpoint, firing artillery at residential areas or firing missiles from warplanes. I feel a little dishonest discussing scripture with you because I do not believe the Bible is the literal word of God as you do, although I can accept that it may well be divinely inspired, in part at least. Modern textual analysis of Biblical texts as well as archeology have shown that not all the events in the Bible are literally true. I expect that for you faith will trump science in this case, and I respect that. I should stress here that, in my opinion, a lack of literal truth does not equate a lack of truth full stop. I believe that reading ancient religious texts (Islamic as well as Jewish) in search of literal historical truth misses the point somewhat, and says more about our contemporary preoccupations than it does about the texts themselves. The people (or God) composing the texts sought not to give a scientifically verifiable account of the world and history but to warn and to inspire, to teach lessons. Anyway, what I am saying here is that even if you are able to prove that the Old Testament calls specifically for the establishment of a Jewish ethno-state with all the 20th century machinery of state (and I don’t believe you can), I still would not support Zionism. Likewise, even if a Wahhabi is able to prove that the only possible interpretation of certain Quranic verses is that all societies at all times should stone adulterers to death (and I don’t believe he can), I still would not support stoning adulterers. I work on this principle: as soon as my interpretation of a text makes me do something immoral, that will unjustly and counter-productively hurt others, I know that I have gone wrong somewhere. Before God gave me religious texts to struggle with, he gave me reason, conscience and compassion. It is not possible that God could be less moral and compassionate than me. To reemphasise (and I know I’m being much too longwinded about this): I think this is a universal problem. Muslims very often squash their own conscience in order to believe, say or do things which they have been brought up to believe are Islamic. 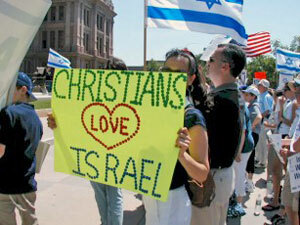 Christians do unchristian things in the name of Christ, and Jews do unjewish things in the name of Judaism. It goes beyond religious communities. Socialists hurt society in the name of society. Democrats do undemocratic things in the name of democracy. Atheists hold unreasonable positions in the name of reason. I also disagree with your statement that Biblical narratives of return to the Promised Land are the foundation of Israeli culture and beliefs. Of course, the Torah is one crucial element of Jewish and Israeli identity, along with the Talmud, modern nationalism, and secular European culture. The first Zionists were European secularists and, in many cases, atheists. Their motivations were nationalist and defensive, and not Biblical. Herzl was a secular Jew who was prepared to establish a state in Uganda or Argentina if Palestine was too politically difficult. Many Western European Jews before the 30s were socialists and internationalists. The European Jewish bourgeoisie produced Marx and Freud. As for Orthodox Jewry, they believed that the return to Israel would not happen until the coming of the Messiah. Some of them understood the return to be symbolic of a spiritual state, some understood it literally, but all thought it would not and should not happen until the Messiah came. They considered Zionism to be blasphemous. A minority of Orthodox Jews, including the Naturai Karta people, still hold to this position. It was the rise of Fascism which changed the minds of most Jews. Anti-semitism, not religion, made Zionism attractive to the Jews. I’m glad that you don’t approve of collective punishment or of the Sabra and Chatila camp massacres in 1982. Sharon also holds responsibility for the blood of 29,500 Lebanese and Palestinians who were killed in the summer of 1982, 40% of them children. In 1953 Sharon helped direct the massacre of 69 civilians in the Palestinian village of Qibya. In 1956 he played a role in the massacre of 270 Egyptian prisoners of war. This mentions only Sharon, and only some of his crimes. Some of these crimes could have been avoided, but it was inevitable that crimes would have to be carried out on a large scale for a state with a Jewish majority to be established in Palestine. Now here is the point on which, possibly, we will find some slight grounds for agreement. I said in one of our discussions that I don’t have a problem with diaspora Jews coming to live in Palestine per se. I have a problem when they seek to drive out and oppress the original inhabitants of the land (who have been there since Canaanite times). In fact, relations between the Palestinians and Jewish immigrants were generally good until the Palestinians realised that Zionist plans were being made to dispossess them. Interestingly, it was the more secular Jewish immigrants who often came in with racist attitudes to the Arabs, rather than the religious, who came with a spiritual love of the land which the Palestinians could understand. (Both Martin Buber and Ahad Ha-Aam have written about their more spiritual, less military and statist approaches to Zionism). Now, I understand that one reason why Christian Zionists support the establishment of the Jewish state is that they believe Jewish return is a prerequisite for the return of Christ. Christ the prophet of love and compassion. Well, about a third of the Jews have settled in Palestine (along with quite a few Russian Christians to make up numbers), but there is no sign of Christ yet, and no sign whatsoever of love and compassion guiding Israeli ideology and behaviour. If the Israelis could find a way of recognising that the birth of their state caused tremendous suffering for the Palestinians, and if they could find a ‘Christian’ way of living in peace with them, without (inevitably temporary) apartheid or military solutions, then the Israelis could indeed be a light unto the nations, and the rule of Christ on earth would be a lot closer. I have to give you credit, you sure know how to articulate your argument clearly and elegantly. You bring up a good point about religion and how it can be misinterpreted. People end up doing very immoral things in their quest for morality as they perceive it. I guess that is why the early Christians and Muslims had a tendency to stay away from those who ruled or of becoming in “Sulta” (leadership and power) as we say in Arabic, and to avoid praise of them. Politics necessitates certain behaviours which might be offensive to the senses of a moral person. I believe that Hagee and his posse are dangerous people and have an agenda to team up with the Jews against Arabs. I suspect that all of this Chrisrian Zionism is about money. It creates a crisis among Christians where money and “troops” are needed for the cause, and Hagee gets money from American Jews and Israel to support his efforts. I wouldn’t be surprised to see in the future Christian travel to the Holy Land controlled by Hagee and his henchmen.